Eaton Lakeview Development, LLC, the developers of the Lakeview/Eaton Street 40B project, offered revised site plans to the Zoning Board of Appeals (ZBA) on January 24. The new plans convert twelve of the one-bedroom apartments in the complex to two-bedroom apartments. This change causes the two smaller buildings of the project that have frontage on Lakeview Avenue to need to be “bumped out” ten feet closer to the sidewalk than originally planned. According to architect Steve Griffin, the total number of apartments and the number of “affordable” units in the planned project remain unchanged. The distance between the buildings also has not been changed. According to the developer, this change was necessitated by marketing and funding factors. Project Engineer Chris Sparages reported that the site plan change also makes minor changes in the drainage report for the project, though the changes will have a “negligible impact” on the ability of the underground water storage unit to handle drainage issues. Sparages stated that a “one hundred year” storm event of seven inches or more of rain would only add an additional eighty-four one-hundredths of an inch of water to the storage unit, well within its capacity. Residents were skeptical of the site plan revisions, as the previous placement of the buildings was negotiated with the neighborhood in good faith. Residents questioned what impacts any other “last-minute” changes may have on the neighborhood. The “pocket park” between the buildings was also discussed at length. The developer indicated a desire to maintain the option of creating more parking in the area at a later date if needed. Initially, the discussion was focused on whether or not town staff could approve this, or if the ZBA should be involved. Chair John Jarema expressed his desire that language is in the final decision which would maintain that area as a green space. Board member Erik Hagstrom concurred, stating his desire that the final decision would “memorialize the green space.” Other board members suggested that they would prefer this as well. 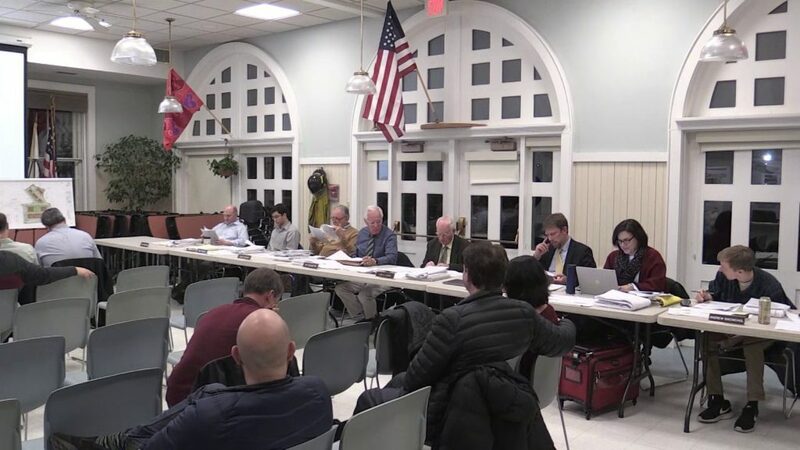 The developer indicated a willingness to contribute to a Walker’s Brook Drive traffic study in proportion with the development’s impact on the road. Assistant Town Manager urged that the study is completed before any action taken in the area to change traffic flow or patterns. The ZBA continued the public hearing to February 20 and adjourned at 10:10 pm.